Indiana has several laws and rules pertaining to child care. 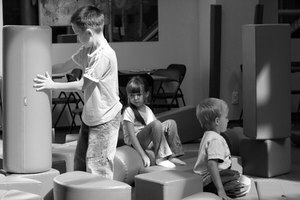 Indiana has several rules and laws pertaining to the licensing of child care centers and homes. These laws and rules are enforced for the safety of day care staff and children. Prior to starting a child day care, know the laws and rules to allow you to make informed decisions and create a healthy business. A child care home is exempt from licensing only if one or more of the following criteria is met: The provider does not receive regular pay for their services; the provider is only caring for children they are related to or are guardians of; the provider cares for less than six children, not including relatives, or provides care for migrant children. Centers and homes must satisfy an extensive list of criteria in order to receive a license. Requirements include submitting an application, planning two weeks of menus that meet food regulations and providing a written health program. The day care building must also pass inspection. In order to become licensed, day care directors must pass a thorough criminal background check. The list of offenses that result in denial of licensing includes torture or cruelty toward any person or animal, criminal sexual acts, child abuse or neglect and drug charges. For child care homes, drug test results must be provided for all staff and persons over the age of 18 who reside in the home. The director and staff must also possess basic first aid training, and at all times at least one staff member on duty must be trained in CPR. Licensed centers or homes must post several pieces of information in an area accessible to all parents. Posted items include staff-to-child ratios, weekly menus, the facility's license, emergency and fire evacuation routes in each room and a list of emergency numbers. Staff-to-child ratios are strictly enforced in Indiana for the safety of both the care giver and the children. The ratio varies greatly between age groups for a child care center. For example, for infants, a ratio of four children per caregiver is required, while for children over 5, a ratio of one adult per every 15 children is acceptable. In a child care home, no more than 15 children under the age of 11 are allowed in the home at one time. This includes children related to the caregiver.